Inc. magazine honors Lamination Depot with distinctive recognition as one of America’s fastest growing privately held companies for the sixth year in a row since their 2012 debut. The company’s mission is to deliver “an exceptional customer experience,” which includes having product readily on hand and offering a user-friendly online shopping environment. In January 2017, Lamination Depot moved their headquarters and distribution center from Santa Ana, California to Irvine, California into a newly constructed facility that is triple in size and houses over 1,500 pallets of products. Lamination Depot launched a completely redesigned website in May 2017 that can be used on desktop and mobile devices alike, allowing customers to filter through over 3,000 laminating, binding, and ID supply products at their desktops or on the go. Lamination Depot continues to develop their privately labeled products – TruLam, TruBind, and TruBadge – and adds new supply and equipment varieties regularly. Their skilled team works collaboratively to maximize their operating efficiencies in order to meet the ever-increasing demand and achieve their challenging goals together. A complete list of all Inc. 500|5000 honorees is available on Inc. magazine’s website. Founded in 2002, Lamination Depot sells high quality laminating and binding supplies and equipment at deeply discounted prices. By purchasing products in large quantities directly from the manufacturers and packaging supplies in inexpensive, plain, corrugated boxes, they are able to offer consumers savings of 50-70% as compared to traditional office supply stores. 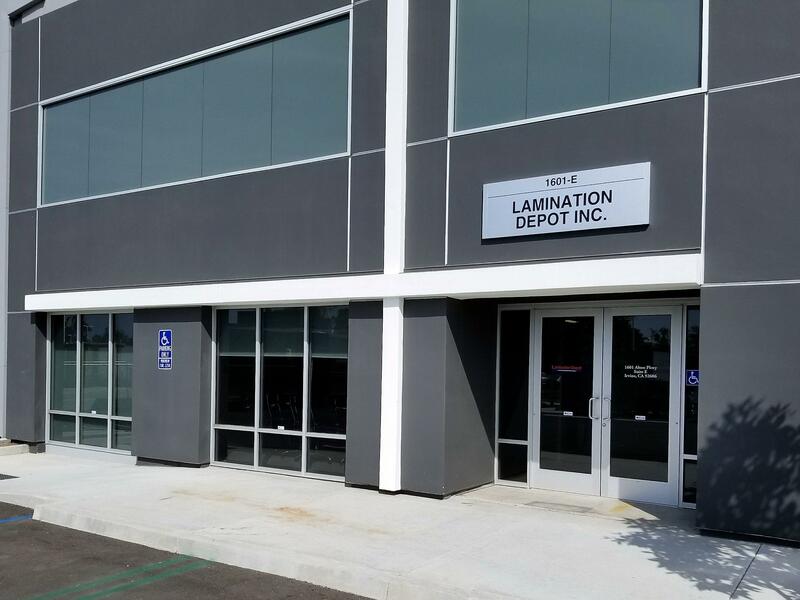 Laminating and binding products supplier Lamination Depot, Inc. has relocated their warehouse and office to a newly remodeled, 16,000 square foot location in Irvine, California. With over 1,000 oversized pallet locations, the new warehouse has more than three times the storage capacity of Lamination Depot’s three previous warehouses combined. During the past year, Lamination Depot has focused on building their inventory of both supplies and equipment to better meet the needs of their customers. Additionally, they have grown their shipping and receiving staff by more than 50% in the past two years, which has allowed them to continue providing the same level of service to their growing customer base. Their new Irvine warehouse features extra-large pallet locations for expanded product accessibility and 30’ pallet racks to accommodate the storage of back-up inventory. "After having expanded our warehouse to include additional satellite locations twice in the last two years, we realized the need for a single, consolidated warehouse that would give us room to grow," says Paul Godfrey, Founder and President of Lamination Depot. "Our new warehouse not only allows us to stock more inventory for improved product availability, but also makes order processing faster and more efficient. We are now able to pick and pack orders faster than ever before, with improved accuracy and a wider selection of in-stock products." Lamination Depot's new office and warehouse is located at 1601 Alton Parkway, Suite E, Irvine, CA 92606. To learn more about Lamination Depot, visit www.laminationdepot.com. Founded in 2002, Lamination Depot sells high quality laminating and binding supplies and equipment at deeply discounted prices. By purchasing products in large quantities directly from the manufacturers and packaging supplies in inexpensive, plain, corrugated boxes, they are able to offer consumers savings of 50-70% as compared to traditional office supply stores. With a focus on superior customer service, Lamination Depot has garnered recognition from both Yahoo Shopping and the Better Business Bureau, where they currently maintain an "A+" rating for reliability. Learn more about Lamination Depot by visiting www.laminationdepot.com. The TruBind TB-S20AP Coil Binding Machine with Electric Coil Inserter and Foot Pedal offers manual punching and electric coil inserting functions at an affordable price. This video highlights some of the TB-S20AP's special features - including oval holes, fully-disengaging dies, and foot pedal operation of the coil inserter - and also provides a helpful demonstration of how to use it to create your own coil-bound books. The TruBind TB-W20A 3:1 Wire Binding Machine is an entry-level manual wire binder that is easy-to-use and features a two-year warranty. This video highlights the features of the TB-W20A and demonstrates how to use both the punching and wire closing functions. Are you having trouble keeping track of items – or people? Laminated name tags are a visually identifiable way to keep track of items or persons during travel or large events. Push one rounded end through the slot, then up through the opposite round end of the loop. Pull the threading end to fix the loop to the tag. Repeat the process using the tag as the threading end to attach to luggage. Metal Clips are quickly attached to a slotted tag by simply pinching open, then releasing to grip the tag. Some clips come equipped with a small plastic strap, which threads and snaps through a tag’s slot, leaving the clip available to clip onto clothing. Neck Lanyards – In addition to a variety of colors and strap styles, neck lanyards come with multiple attachment styles. The two most common styles are a swivel J-hook or a bulldog clip, which operates much the same as the metal clips discussed earlier. To attach a tag to a swivel hook, pinch the straight piece that presses against the lower tip of the “J,” thread it through the tag hole, then release to close. What kind of tools can I use to punch holes or slots in my tags? Swivel J-hook lanyards can be attached to items simply punched with a round hole punch. However, clear plastic loops and metal clip attachments work best with tags that have a slot – a rounded rectangular shaped hole. Rounded holes can be punched using a simple hand-held punch found in most office and craft supply stores, but slots require more specialized tools like the TruLam Stapler-Style Slot Punch (Item #TL-SPUNCH). There are other tools available that can punch both styles using the same machine, like the TruLam 3-in-1 Slot Punch. Imagine a work environment that requires more than one or two binding styles available. For example, a print shop needs to be able to bind books with either plastic spiral coils or 3:1 pitch twin-loop wires, depending on the project assignment. A quick solution would be to purchase a dual-function binding machine like the Akiles DuoMac; however, keep in mind that this machine can only perform two functions. The same print shop from our example just received an assignment that requires 2:1 pitch twin-loop wires. Should they purchase a new binding machine solely devoted to 2:1 binding? Technically, yes the shop could buy a new separate machine. But if that print shop had originally purchased a modular binding machine with interchangeable dies, they would only have to purchase the newly required die set. Modular binding machines are highly valuable in environments that use multiple binding styles in the same workspace. Rather than purchasing an additional binding machine devoted to only one binding style, users with modular binding machines simply purchase a new die set. Replacement die sets are not only easier to store than a whole other binding machine, but they are easy to replace when the dies grow dull and no longer punch as effectively. One can save hundreds of dollars by simply replacing a machine’s set of “teeth,” rather than replacing the whole machine! Modular binding machines are available in both manual and electric models, offering solutions to work environments with varying project volumes and budgets. We’re happy to help you find the machine that’s right for you whether it’s single or multi-function! Inc. magazine has ranked laminating and binding supply company Lamination Depot in position 3,506 on their 2016 Inc. 500|5000 list, which recognizes the fastest-growing, privately-owned companies. Lamination Depot ranks no. 339 among all companies listed in the Business Products & Services category and no. 35 among Business Products & Services companies within California. This is Lamination Depot’s fifth consecutive appearance on the list, after their debut on the 2012 Inc. 500 | 5000 and subsequent appearances on the 2013, 2014, and 2015 editions. Over the course of the evaluation period, which spanned from 2012 through 2015, Lamination Depot increased their revenue by 90% and nearly doubled their on-hand inventory. Among the contributing factors to this growth are the expansion of their private-label supply and equipment brands, new purchasing strategies designed to better meet customer demand, and an increased emphasis on streamlining business processes. During the past year, Lamination Depot has focused on expanding their private-label product lines, TruLam, TruBind, and TruBadge, while building their inventory of in-stock items for faster order fulfillment. One of their greatest areas of growth during this period has been their line of TruBind binding machines, which currently includes 11 exclusive models. Additionally, Lamination Depot has invested in new staff and business resources to continue providing the same level of service to their customer base amidst growing demand. A complete list of all Inc. 500|5000 honorees is available on Inc. magazine’s website, at www.inc.com/inc5000/. To view Lamination Depot’s complete profile, visit www.inc.com/profile/lamination-depot. Founded in 2002, Lamination Depot sells high quality laminating and binding supplies and equipment at deeply discounted prices. By purchasing products in large quantities directly from the manufacturers and packaging supplies in inexpensive, plain, corrugated boxes, they are able to offer consumers savings of 50-70% as compared to traditional office supply stores. With a focus on superior customer service, Lamination Depot has garnered recognition from both Yahoo Shopping and the Better Business Bureau, where they currently maintain an “A+” rating for reliability. Learn more about Lamination Depot by visiting www.laminationdepot.com. Selecting a binding machine with a foot pedal offers even more benefits to an already high quality piece of binding equipment. Hands-free operation – When a foot pedal is used to operate the punch function of a binding machine versus pulling a handle for each punch, the machine user is able to isolate his or her hand movement solely to picking up sheets and removing them from the machine. Increased productivity – Additional time spent manually punching sheets with a handle is saved by the quick tap of the foot pedal, ultimately saving money spent on manpower and increasing the volume per hour spent binding. My manually operated binding machine comes with a foot pedal – what is it used for? Select spiral coil binding machines that punch manually also come with a foot pedal, which is used to control an electric coil inserter roller. Pressing the foot pedal does not operate the machine dies for sheet punching; however, less time is spent on inserting coils because the user is only handling the binding materials instead of switching the machine on and off during the binding process.